A student recently asked if my hatha yoga practice is the same now as when I was in my 20s. A bit defensively I answered, “Yes, of course.” As I pondered the question later, I realized a more honest answer is, “In my 60-something body I practice many of the same postures. I just do them differently.” I’ve come to name this “doing” a Yin Approach to warming up well and stretching while in the asana. Particularly important for those of us in mid-life, it is also an effective approach for beginners and for students returning to practice after a lapse. Let me explain the Yin Approach (not to be confused with Yin Yoga, in which poses are held for several minutes). Let me explain the Yin Approach (not to be confused with Yin Yoga, in which poses are held for several minutes). The concept of yin and yang comes from the Taoist tradition. If something is yin, it can be described as cool, calm, inward, and focused—like the way we approach a stretching posture. Yang is moving, heated, excited, and intense—like a strengthening posture. Like a new piece added to a puzzle, I enjoy a Yin Approach, balanced with yang strength, in almost all postures. A Yin Approach to warming up my mid-age muscles and soft tissue makes me feel safer, more comfortable, and complete while in the posture. In our late 20s, both muscle and layers of connective tissue begin to lose resiliency, and continue to change and contract every 7 to 10 years thereafter. Life’s stress, wear-and-tear injuries, and inactivity all leave their mark within the layers of the body. It is no wonder that the older we get, the more “creaky” we can feel. 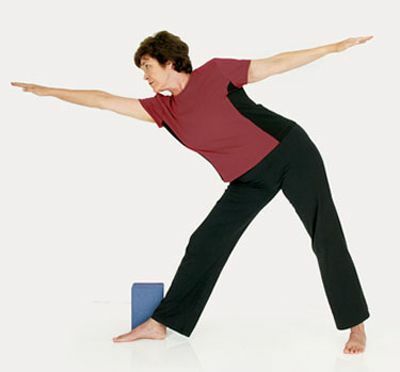 The good news is that no matter what your age, size, or shape, you can maintain or return to a graceful, fluid suppleness and strength by using the Yin Approach. The Yin Approach is cool, calm, and focused, with occasional flashes of heat. It is knowing that asanas affect connective tissue as well as muscles. Muscles respond beautifully to pumping actions such as the dynamic moves pictured in the Standing Forward Bend (page 93). But connective tissue—tendons, ligaments, fascia—is different than muscle and needs to be treated differently. Connective tissue is fibrous, dryer, stiffer, and has less blood supply than muscle. When you move into your asana routine too quickly, too deeply, and without warming up enough, it is easy to irritate connective tissue, especially the fascia. Fascia covers your entire inner body like a saran-like bag, surrounding every muscle, gland, and organ. When fascia is irritated it contracts and takes a long time to heal. The underlying muscles are also affected. Fascia covers your entire inner body like a saran-like bag, surrounding every muscle, gland, and organ. When fascia is irritated it contracts and takes a long time to heal. The underlying muscles are also affected. For a sometimes dramatic and easily done demonstration of how warming up and working one small body part can affect the functioning of the whole, start at the soles of your feet, which consist of thick fascia layers. Like the soles of your shoes, they protect your feet. Massaging the fascia aids in releasing it. As you will see, this helps release tissue throughout the legs and back. First, do a simple forward bend. Sit on the floor with your legs extended in front of you, knees straight. Lean forward, extend your arms, and note the final resting position of your hands on the floor. Hold for 10 breaths, with your eyes closed, and observe how it feels along the back sides of your body. Sit up and roll a golf ball or tennis ball deeply into the bottom of one foot. Roll it slowly behind and on top of your toes, ball, arch, and along the edges of your heel. Be thorough rather than fast and vigorous. Keep it up for 2 to 3 minutes, covering the whole territory of the foot. Now repeat the forward bend. Go slowly, folding forward. Close your eyes and feel the difference in one side compared with the other. Note your final hand position. Take your time. Pay attention to what you are feeling. Get up and walk around. Feel the difference between the two sides. Sometimes I use other forms of self-massage as a warm-up such as tapping or thumping the hamstring or shoulder muscle with a cupped hand or gently closed fist. Tapping muscle fibers helps them to release their tightness. Try this and see for yourself. Sit tall in your chair, with your shoulders directly above your hips. With awareness, look over your right shoulder. Come to a natural stopping point. Find a spot on the wall, and remember it. Return your head to center. Then again slowly look over your right shoulder. Remember your stopping point in the first step? Have you gone farther? Have you increased your range of motion just a little? Chances are you are saying yes. Now repeat this tapping warm-up on the other shoulder. Rolling around on the floor is another form of warming up. I ask students to mindfully roll on the floor or on a ball, using their body weight as an overall massage to purposefully soften the body’s connective tissue, specifically the fascia. The following playful rolling moves will enhance flexibility, release restrictions of soft tissue, and increase all-over body circulation. Use your own body weight to give connective tissue a massage. This “rolling pin series” is nurturing. It makes me smile and often brings a laugh to the class. Exhaling, allow the weight of your arms to draw your thighs toward your chest and the weight of your torso to melt the lower back to the mat. If needed, use a belt on the back of your thighs. The back of your head stays on the mat, shoulders down. Close your eyes and imagine with the next inhalation your entire spine lengthening from skull to tailbone. This is a comforting, peaceful pose. Stay in it for a few more breaths. Now become a Little Boat by introducing a gentle rocking movement, side to side. Comfortably and mindfully rock right elbow to left elbow, side to side. Don’t forget to roll onto your shoulders and upper back. Now for some hip rolls. Sit on your mat, knees bent, feet flat. Place your hands on the floor behind you and lean back, supporting your weight with your arms, lifting your feet a few inches off the mat. Your body weight rolls past your tailbone and onto the sacrum (the flat part of your lower back). Now roll slowly from side to side over your seat muscles and up your outer hip. Feet are off the floor as you continue gently rolling side to side, not on the tailbone. Try playfully extending one leg out, then the other, as you roll. Do this for about a minute, or as long as feels comfortable. creative! Tapping, massaging the fascia, rolling the body like a rolling pin, and using the “three Rs” are all part of a yin warm- up. The three Rs—Resist, Relax, Restretch—are a proprioceptive neuromuscular facilitation (PNF) technique that involves alternating isometric muscle contraction and passive stretching. 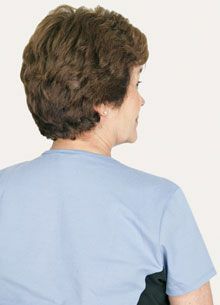 The three Rs—Resist, Relax, Restretch—are a proprioceptive neuromuscular facilitation (PNF) technique that involves alternating isometric muscle contraction and passive stretching. Before stretching a muscle, you tighten it and push against a fixed object—a partner, your own hand, a belt, the floor, or a wall. The subsequent stretch becomes longer, deeper, and far more comfortable than holding the limb in a static stretch. The three Rs are a creative way to listen to your body and to gently increase your range of motion. This is a safe, simple technique that helps to lovingly “trick” muscle fibers and connecting tissue to soften, lengthen, and release painlessly. I love seeing students’ amazement at the improvement in their own flexibility when they use the three Rs. Warming up creatively and using the three Rs will keep your practice fresh and always interesting. Try 10 minutes of warm-ups to start your day or to begin your yoga practice. 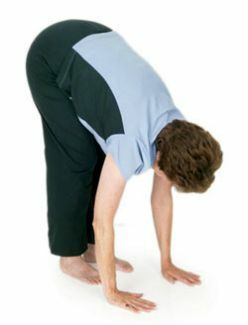 You can also do 3 minutes of well-thought-out warm-ups to prepare your body for a particular asana. The following warm-ups are designed to enhance strength and flexibility, increase circulation, safely soften connective tissue, and release tension. They are also designed to warm you up for the Triangle Pose and to demonstrate how beautifully the three Rs work in this particular pose. Warming up well before starting our practice makes sense not only for the mid-age body, but for everyone—especially beginners or those who haven’t practiced for a while. At the end of your warm-up, you should feel more alert, coordinated, physically warm, and comfortable in your skin. Your breathing will have deepened and eye sight should sharpen. And best of all, you will not feel tired. Benefits: Adding big sweeping movements to postures warms up the big muscles of the body quickly and enjoyably. Begin with simple forward bends. Fold and unfold the body, breath and body flowing together again and again. These bends lengthen the entire back body and make space between the vertebrae of your upper neck. I like these poses because, as you will soon see, they are very versatile. Gravity helps free the cervical spine and allows the neck muscles to relax, improving overall circulation and having a calming effect on the body and mind. Caution: Be careful with all forward bends if you have disc problems. If you have any questions, check with your doctor or health professional. Start in Sacred Mountain Pose, with your feet slightly apart, your shoulders down, and your hands in namaste. Inhaling, raise your arms forward, then up overhead, arching your back slightly. As you exhale, sweep your arms out to the sides and bend forward from your hips. When you feel the pull on the back of your legs, soften your knees. Let your arms hang and touch the earth (“earth” could be a block or a chair in front of you). Ease your knees just a little more to relax your lower back. As you inhale, roll up slowly, and then raise your arms overhead. Repeat the steps 3 more times. Then stay in the folded position. It feels relaxing to fold your elbows and allow the weight of your arms and torso to gently stretch your body toward the floor. No bouncing! No straining! To come up, place your hands on your legs and walk up. Be sure you continue to breathe. Stand tall. Yin tip: If leg and back tightness makes this position really uncomfortable, practice with your elbows or hands on a chair seat or other support. Benefits: Warms up the legs and hips for standing poses. Begin in the Knees-to-Chest Pose. To stabilize and support your lower back, place your wrists beneath your sacrum to “make a nest.” Straighten your legs and shake them out for 10 seconds. This shaking actually helps muscle fibers to soften and release tension. Now pretend your legs are like two giant strands of seaweed moving gracefully in all directions with the warm current of the sea. Be creative: two legs moving separately, bending and extending in all different directions for 3 to 6 breaths. Enjoy! Then pause. Bend your knees, and place your feet on the mat. Close your eyes, allowing time to observe how your legs feel. Benefits: This is an excellent warm-up for all standing poses, especially the Triangle. A comfortable yet powerful hamstring stretch, this is different than simply bending forward. After a few times, my students experience significantly improved flexibility in their hamstrings, and comfort within the Triangle. Begin in Sacred Mountain Pose, but with your feet wide apart. Turn your left foot in and your right foot out. Bend your right knee about 90 degrees. Turn your torso toward the right and fold forward over your thigh. Your chest will touch the thigh. Place your left hand on the floor, close to your right foot, for balance. Wrap your right arm around your right thigh and “hug” your thigh. – Start gentle Resistance by trying to lift your chest away from your thigh, yet keeping tight contact between them. Your head lifts, and your back stays long. Hold for 3 breaths. – Exhale…go deeper into the pose, Restretching the leg without losing chest/thigh contact. Hold for 3 breaths. Observe how your leg has released painlessly. – Come out of the pose carefully and with awareness. Yin tip: As you progress, begin to very slowly straighten the forward leg without sacrificing the body/thigh closed position. tissue connections in the hips. Stretches the muscles between the ribs, thus improving breathing capacity. Stand in Sacred Mountain Pose. Close your eyes. Take a few slow breaths, become aware of where you are and the room around you. Open your stance 3 1/2 feet apart. Look down; make sure your left foot is turned in about 45 degrees and your right foot is turned out 90 degrees. Step One: Now let’s move into Triangle to the right. Inhaling, raise both arms out from your sides, arms parallel to the floor. Your body will form a 5-pointed star. Exhaling, extend your right arm out into the space to the right, continue extending as though sliding your arm across the kitchen counter, turn your upper torso to the left. Then drop your right hand to your right shin, below the knee, or to the block resting on the outside of your right foot. The right leg is straight. Lift and reach your left arm up to the ceiling. Hold for 3 breaths. Step Two: To make step one more comfortable, do the three Rs from Hug a Tree. Follow the directions from Hug a Tree. Bend your right knee, turn your torso right, fold over your right thigh. The chest touches the thigh. Place the left hand on the floor, close to your right foot, for balance. Wrap the right arm around the right thigh and “hug” your thigh. - Resist by folding the chest to the thigh, gently trying to pull away as the ribs keep contact with the leg. Your head lifts, the neck is relaxed, the back is long. Hold this gentle steady resistance for 3 breaths. - Restretch by lifting the chest a few inches off your thigh. Exhaling, lengthen the muscles of your right leg very slowly. Hold for 3 comfortable breaths. Then, slowly and carefully, come up to the 5-pointed star. Step Three: Move slowly again into Triangle with all of your awareness. Extend your torso to the right, the right hand above the knee, and reach the left hand with enthusiasm to the ceiling…Note how your right leg, hip, and abdomen have released some of their tightness. Hold for 2 to 3 breaths. Come up slowly. Repeat all three steps on the opposite side. Caution: More is not always better when it comes to the three Rs. Never force your body into any position. To avoid overstretching, do the three Rs in the Triangle only twice a week. Remember to go slowly and consciously as you enter and exit the final pose. Adapted from Lilias! 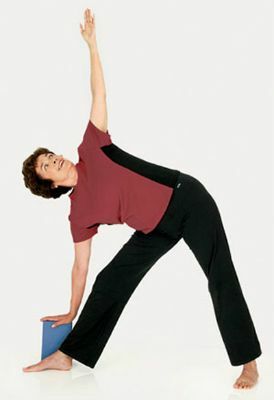 Yoga Gets Better with Age, by Lilias Folan. Printed with permission from Rodale, copyright © 2005 by Lilias Folan. 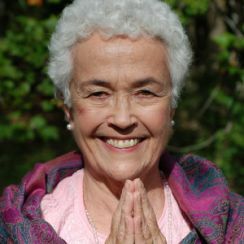 For more information on Lilias Folan’s upcoming workshops and appearances visit www.liliasyoga.com.